In August, 2009, at the request of the U.S. Masters Open Water Committee, the course at Chris Greene Lake was professionally surveyed. 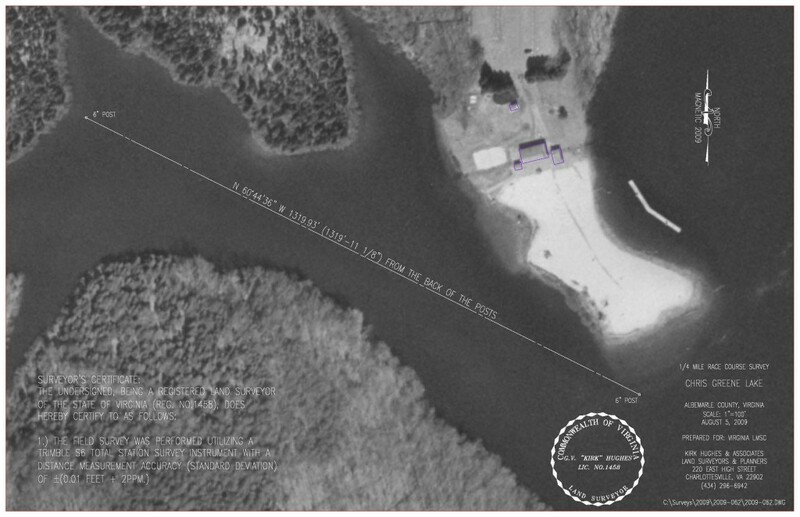 The results indicated a distance of 1319 feet, 11 and 1/8 inches, from pylon to pylon. That was 7/8″ shy of being precisely a quarter-mile, and well within the 6″ leeway (plus or minus) allowed by USMS rule 302.3.1. Because the course is a straight, measured distance and the start/ finish are in the water, the 1 and 2-mile cable swims qualify for national records. The survey can be seen here (higher resolution), and below.